Graig Fawr stands guardian above the village and the former mine workings which for nearly a hundred years, throbbed with activity. From the top of the National Trust-owned site, a 10 minute walk from the road behind, you can see Rhyl laid out to the left of the white summit marker. To the right is Prestatyn and Ffrith Beach on the seafront with Meliden below further inland. The surrounding hills are known locally as Prestatyn Hillside, part of the Clwydian Range, and the start of the 177-mile Offa’s Dyke Path between Prestatyn and Chepstow. Graig Fawr located near the Denbighshire coast, consists of wooded slopes and limestone outcrops that rise steeply, above the village of Meliden. The rock is a dominant and dramatic landscape feature formed of carboniferous limestone, and marks the northern end of the Clwydian Hills. The limestone extends westwards along the coast as a line of prominent hills that occur along this stretch of coast including Moel Hiraddug at Dyserth, and Rhyd-y-foel and Bryn Euryn further westwards. Graig Fawr (colloquially known as ‘Meliden Mountain’) provides interesting habitat. The exposed location near the coast and the bleak limestone outcrops have resulted in the presence of a number of species normally associated with sea cliffs. The site is owned by the National Trust. Due to the nature of the substrate and the lack of agricultural intensification on these steep slopes, semi-natural plant communities are able to thrive. Such is the national significance of the nature conservation interest that most of the hillside has been notified by the Countryside Council for Wales (CCW) as a Site of Special Scientific Interest (SSSI). In addition to landscape and wildlife considerations, the area also has a wealth of historic and archaeological interest. Of significance is the range of industrial archaeological relics which have survived. Mine levels and spoil heaps, many now obscured by vegetation, also provide evidence of a history of mining activity in the locality where lead and zinc were mined extensively. Rich mineral intrusions occurred in the limestone around Graig Fawr. These veins ran predominantly from south west to north east and were mined extensively. The Talargoch mines were probably first dug by the Romans to extract silver or possibly lead. Silver continued to be mined during the Middle Ages and up to the mid-18th century when lead and zinc extraction became more profitable. There is a vast network of caves and tunnels within Graig Fawr, the openings of which you can see from the main road have now been gated over and locked by the council. As a child I remember exploring these caves and noting the many pick marks and old ladders that remain from the mining days. 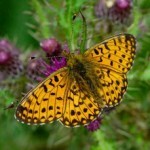 Limestone grasslands – Graig Fawr, Meliden support many species of butterflies including the pearl-bordered fritillary. Meliden Caves – winter hibernation sites for the rare lesser horseshoe bat. BRONZE KNIFE FROM GRAIG FAWR, MELIDEN, FLINTSHIRE – The socketed knife shown in the sketch here figured was found by me on July 24th 1946, lying on the surface of a rocky knoll beside a track worn by tanks over the turf, about 150 yards S.S.E. of the trigonometrical station at the top of Graig Fawr. Four yards S.E. of the knofe was a small area of dark red soil somewhat crushed by tanks, of the same colour as the sandy soil which can be seen inside the socket. Careful search all round the spot revealed nothing else that could be directly connected with the find. Graig Fawr lies in the community of Dyserth in the county of Denbighshire. It is located at Ordnance Survey national grid reference SJ06008050. The mine is recorded in the CPAT Historic Environment Record as number 18084 and this number should be quoted in all correspondence. Workings: The limestone hill of Graig Fawr is probably the site of very early mining. Earthworks appear as open workings on a vein and runs of small shafts, which follow north-east to south-west veins. One shaft appears concrete capped at SJ06108040. The numerous opencuts that appear on the hillslopes indicate 18th century activity or earlier. Smith (1921) illustrates a haematite and copper lode cutting the hillside. The opencuts at SJ06408040 are stone quarrying. Along the line of the Mineral Railway, several adits have been blocked off, which cut into the northern and western slopes of the hill. Further series of levels can be identified up the western slopes in the area behind the main Talargoch Mine site (SJ05908060). The south-west side of Graig Bach is also covered with open-cut workings, the most distinct being the China Rake, which crosses the hill in an east to west direction. The rake is early and probably hand worked. Transport: The Mineral Railway follows the contours of the 1750s leat around the foot of Graig Fawr. Power: The 1750s leat contours the lower slopes of Graig Fawr on its western side.